"I was so excite to see you bring back you're spiked bows. and now my grand child will to. A fun way to add lots of color to that special outfit. Choose up to four different colors to match your little girls clothing. Lots of Halloween ribbon spiked just right. Lots of Daisy and gator print ribbon spiked just right . Lots of peace sign ribbon spiked just right . Looks wonderful as a single hair bow and works great for piggy tails too. 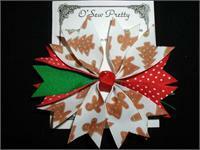 Lots of Reindeer print ribbon spiked just right. Lots of gingerbread print ribbon spiked just right . Looks wonderful as a single hair bow and works great for piggy tails too. Lots of snowman print ribbon spiked just right. Looks wonderful as a single hair bow and works great for pig tails too. Lots of Poodle ribbon spiked just right . Looks wonderful as a single hair bow and works great for piggy tails too. Lots of Turkey ribbon spiked just right . 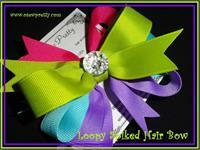 Looks wonderful as a single hair bow and works great for piggy tails too. Lots of flag ribbon spiked just right. .
Lots of Candy Hearts ribbon spiked just right . 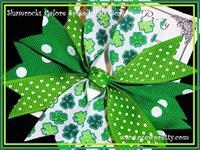 Looks wonderful as a single hair bow and works great for piggy tails too. 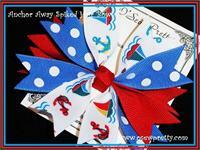 Lots of nautical ribbon spiked just right. Choose the accent color to match her soccer team. Choose the accent color to match her zebra outfit..
Lots of gold fish print ribbon stacked just right. Lots of ice cream cone print ribbon stacked just right. Lots of flip flop ribbon spiked just right. Lots of cup cake print ribbon stacked just right. 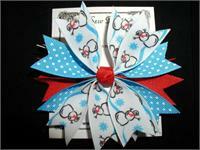 Lots of Daisy and lady bug print ribbon spiked just right . Lots of Peppermint candy print ribbon spiked just right. Lots of Ho Ho Ho Ho! and Santa hats printed ribbon spiked just right. Your little girl will be in love with this multi color hair bow.